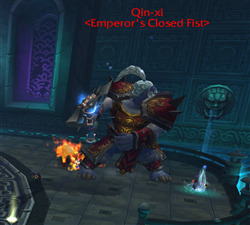 These bosses make up the Will of the Emperor encounter, which is the final "boss" of Mogu'shan Vaults. For ten man, you need two tanks, 2-3 healers (depending on their skill and gear level) and the rest DPS. There are a variety of positions a raid can use, but the easiest and most common is to put one boss at the bottom of each set of stairs -- you'll want them split -- and have the raid stack on the circle in the middle of the floor. 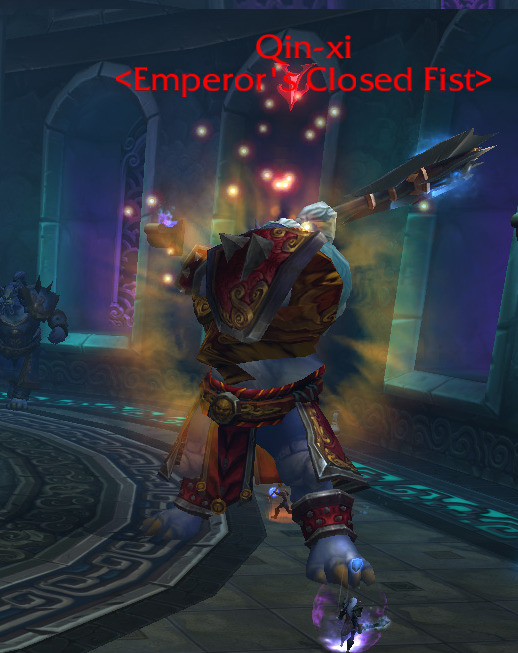 This can be a very long fight, particularly if DPS is not high and/or the tanks are not successful at "dancing." Throughout the fight, the raid will encounter waves of trash that needs to be killed. 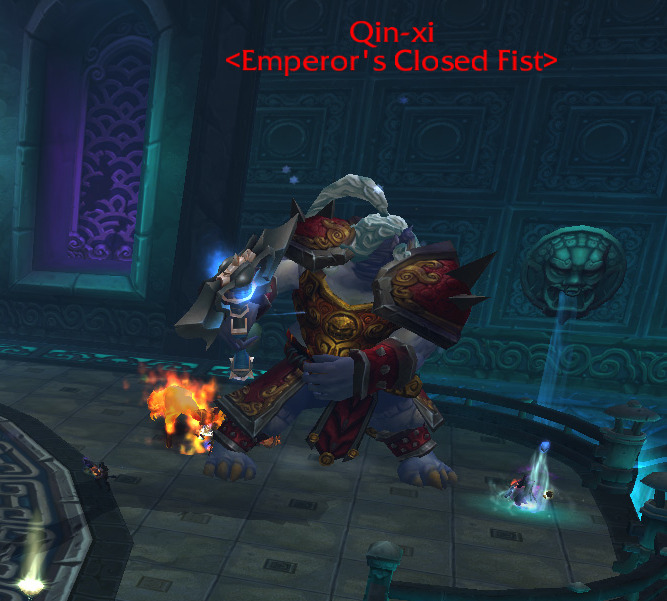 Initially and in undergeared raids, the entire encounter for DPSer will be spent killing these adds while the bosses are almost completely handled by the tanks themselves. Generally, the priority on adds is the Shield guy (Courage; that must be killed before he reaches the tank), the Big guys (Strength; that stun), and the little guys (Rage; that just beat on random folks a little bit) and the bosses lowest priority of all. These adds do not need tanked, although the little ones might need to be kited if they are focusing on a clothie. The two bosses share a health pool, so DoT classes might find it beneficial to keep their damage ticking on the bosses while they work on the adds. Success in this encounter is almost entirely determined by the tanks' skills at dancing the Devastating Attacks. This is because failures in this area not only make the tanks difficult (if not impossible) to keep alive, but also significantly impact the DPS on the bosses, which is largely due to the Opportunistic Strike ability that is granted for successful dodges. The bosses will regularly do an ability called Devastating Attacks. This consists of five attacks that must be completely dodged by everyone in melee, including tanks. Which attacks the bosses do is random, but can be determined both by the blue slashing line in the air for the Devastating Arc (marking the 180 degree region their swing will hit) and the animation of the bosses (if they raise a leg, for example, they are going to AoE stomp around them). For every ability eaten, players take damage and get a sunder debuff which stacks and makes healing very difficult (note: the stomp does not apply the debuff but will stun the tank). However, if all five swings are successfully dodged without the player leaving melee range, you will get an extra action bar with Opportunistic Strike. This strike must be used IMMEDIATELY, as it only is available within a few second window. These strikes do a lot of damage and will end up being responsible for the majority of the damage on the boss. Healers primary concern in this fight is keeping the tanks alive (the bosses hit like trucks even without the debuff), as well as the DPS. Several times in the fight there is a phase called Titan Gas which does a lot of raid wide damage. Save healing and cooldowns for the raid for these periods. During the Titan Gas, no adds will spawn for a short period of time, and DPS will get some time to work on the bosses and try their hand at dancing.